The Duke of Sussex and the Duchess of Sussex ride in the Ascot Landau carriage during the procession after getting married at St. George’s Chapel, Windsor Castle, on May 19, 2018, in Windsor, England. Representation matters. We’ve both heard and said it repeatedly: Our visibility and presence—in every arena—is vital to our perception of ourselves and what spaces we believe we deserve to occupy, both in the world and in the scope of the human imagination. But aside from that, contrary to the Rev. Al Sharpton’s surprisingly naive opinion, no one here is under the illusion that the new Duchess of Sussex is going to change the course of white supremacy—or the long and brutal history of imperialism and colonialism that Britain has both perpetuated and passed down to its younger brother, America. If the election of the first black biracial American president only served to stoke the ire of the irrationally entitled, an interracial marriage into the British monarchy is probably not going to spontaneously inspire world peace (or solve racism, hunger or inequality), amirite? Frankly, that’s not even a fair expectation to place upon Markle’s newly crowned head, as ending any ism remains the job of those who perpetuate it. And, as the royal family is currently more of a PR-driving figurehead than absolute British rule, it’d be a losing battle, anyway. But with that in mind, it could be argued that the question of Meghan Markle’s relevance is only, well, a relevant question if one is predominantly concerned with the white gaze—and the white supremacy so often adjacent to it. Fun fact: When I was a little girl, my parents refused to buy me any dolls that weren’t black because they didn’t want me to aspire to a beauty standard that didn’t include me (forget the skinny and perpetually-in-heels part). Accordingly, my Barbie Christie collection (which didn’t really resemble me, either, tbh) was pitifully small, which was fairly devastating to an already fashion-obsessed child. It would take Mattel 40 years to introduce a full range of dolls that could even hope to begin to reflect the range of children (and doll enthusiasts) who want to be part of the Barbie universe. I now have a young niece who’s only just beginning to take an interest in dolls. Despite my own childhood disappointment, should I not consider it progress that if and when she asks for a Barbie, I can now get her one that has a massive mane of naturally textured hair, just like her? Meghan Markle is a living, breathing human being—a fact many seem to forget when discussing her—and while very light-complected and straight-haired, she is the first black woman to be openly acknowledged by the British royal family (despite not being the first to potentially enter the royal bloodline; she’s not even the only black princess in Europe). Is that not a space we are (finally) entitled to be represented in, too? Growing up in a homogeneous community in Pennsylvania, the concept of marrying an African-American woman was not on the cards for my dad. But he saw beyond what was put in front of him in that small-sized (and, perhaps, small-minded) town. ... He wanted me to find my own truth. 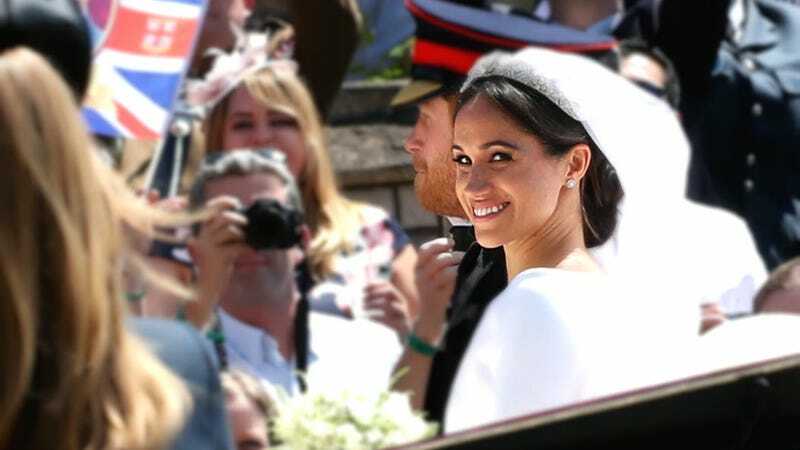 Markle’s truth was evident in the choice of a black priest to deliver an impassioned homily at her wedding. It was evident in the gospel choir that followed. It was evident in her musical selections. And most profoundly, there was tangible evidence of Markle’s heritage in her mother, Doria Ragland, to whom Markle once wrote a deeply loving tribute on her now-defunct blog, The Tig. Because bottom line: Representation does matter. While I don’t personally aspire to be a princess (or know anyone who does, though I’m sure they’re out there), if only mere months ago we were collectively overjoyed to meet the fictional black princess of a country that exists only on-screen, does it really make sense to be dismissive of a real one in one of the most powerful countries in the world? If only mere months ago we were collectively overjoyed to meet the fictional black princess of a country that exists only on-screen, does it really make sense to be dismissive of a real one? I think the challenge for the royal family is how to be a family that represents very old-fashioned values—of intergenerational inherited privilege—in a society that’s about equality of opportunity and multiculturalism. And I think that Meghan Markle is certainly someone who represents the latter; she has become successful through her own talent and hard work, she’s used her celebrity to champion causes that she’s passionate about, and also, as a woman of mixed heritage, she hasn’t shied away from speaking about that; she’s owned it. And for me, as a black British woman of mixed heritage myself, I think there’s been a lot of pressure in my lifetime in this country—if you’re entering spaces that have previously been very white—to downplay your identity. And I think she represents a real cultural change in her willingness not to minimize it, but to speak about it. And for me, that sends a powerful signal, that you can own your identity and it’s not a taboo; it’s not something to shy away from. And that also, there is nothing essentially ‘white’ about Britishness. You know, for a lot of people, the royal family represents a sense of British identity, and until now, that has been an identity very much linked to whiteness in many people’s perceptions. So, I think the visual and symbolic change that Meghan’s entry into that family represents is actually quite profound. Prince Harry, Duke of Sussex, and his wife, Meghan, Duchess of Sussex, leave from the West Door of St. George’s Chapel, Windsor Castle, on May 19, 2018, in Windsor, England.